Your expanding multi-location business places ever increasing demands on your network. Increasing numbers of bandwidth hungry applications essential to your business need high quality, secure connections that are cost effective and reliable. Whether these locations are branch offices, or the offices of customers or vendors or business partners, quality connectivity is a critical part of your business’ success. 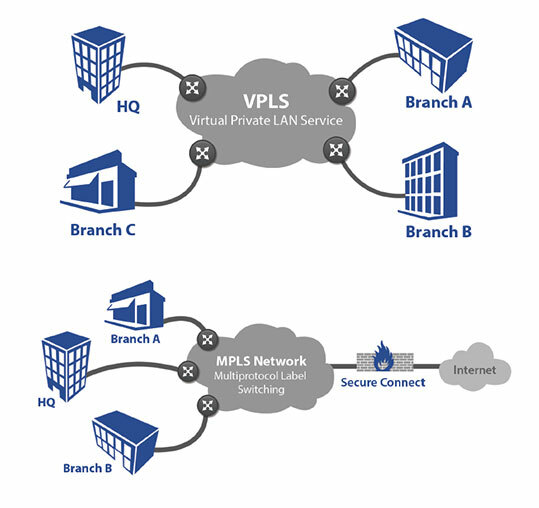 If you are considering secure connectivity options, MPLS/VPLS provides better security than older VPN technologies like ATM or Frame Relay, with improved performance and value! Our fully-meshed, direct site-to-site data paths outperform hub-and-spoke topology. By reducing the distance that data needs to travel, we are able to deliver faster data communication and increased productivity for your business. We can provide secure connectivity wherever your growing business takes you, across the US and beyond! Enables high quality for mission critical business applications like Voice over IP (VoIP), credit card transactions, video, and mission critical enterprise applications. Prioritize traffic based on your needs. We can provide the right bandwidth to fit your needs, regardless of location, including business grade T1, DS3, and Ethernet. We can also provide secure VPN access to your remote workers using their home or mobile internet connections. Connect anywhere from as few as two locations to hundreds of locations across the United States. First Communications MPLS/VPLS provides business organizations with a secure connectivity solution that enables expansion and growth to any location while reducing costs. Extend your enterprise network to new locations simply and efficiently. No “one size fits all” solutions here. First Communications will design a custom solution so that you can easily meet your current and anticipated future demands. We have Class of Service (CoS) customization options which allow you to prioritize your traffic within your network to provide optimal performance and in accordance to your needs. This enables the highest quality voice connections for VoIP service. This is customer defined, and is ideal for video conferencing. This prioritizes data networking packets over internet traffic. This is standard data networking solution, enabling businesses to share data and applications across all locations.